In search of a psychedelic high, some teenager, somewhere, will turn to nutmeg. Yes, that aromatic spice used in pumpkin pie and eggnog can take you for a trip. And people have been trippin’ on nutmeg for centuries. 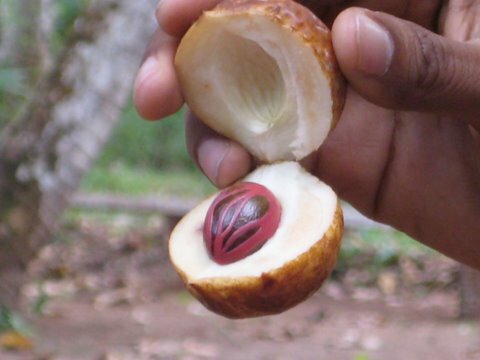 Nutmeg also has a long, relatively speaking of course, history as a hallucinogen. Many (now) prominent peple have published on its psychedelic effects. This includes Dr. Andrew Weil, he of healthy living fame (2), Albert Hofmann of LSD fame (3), and Alexander Shulgin, the “Godfather” of synthetic hallucinogens and PiHKAL fame (4). That right there is a Mount Rushmore of something – minus Teddy Roosevelt, but everyone forgets about him anyways. So these three titans, for diverse reasons, spent time and effort investigation the role of nutmeg as a hallucinogen, so there must be something to it. As early as 1576 there is reference to an English woman who became “inebriated” and delirious after consuming 10 nutmegs (1). And for you uber geeks, even Jan Evangelista Purkinje (we named some brain cells after him!) experimented with nutmeg and had hallucinations that lasted several days (2). The chemical substance behind this? Myristicin. [If it looks a bit like Mxyzptlk to you, put down the comic book.] I always like to know the pharmacolgy behind these drugs and poisons. Activity at the receptor level explains so much, and without it I feel a bit lost. That’s how I feel about myristicin. Lost. There just isn’t any good data on how exactly myristicin works – what it binds to, what it activates. Shulgin’s hypothesis is probably best (4). He proposed that myristicin becomes aminated in the body, presumably the liver, to MMDA. MMDA is a known hallucinogenic, extremely similar to MDMA (Ecstasy) and behaves as a serotonin receptor agonist at the 5-HT2A receptor. This receptor is known for the “classical” psychedelic experience. Shulgin’s hypothesis was put to the test in liver models, and myristicin did indeed biotransform into MMDA (5). There has been no evidence to date, however, of this happening in animal models or in humans. So what can one expect from myristicin and nutmeg consumption. It appears to be a mixed bag, but the consensus seems to be a pretty crappy trip from the sounds of it. In all of my drug talks I try to be fair, and with apologies to Clint Eastwood, give examples of The Good, The Bad, and The Ugly. Poison control data from California (9) backs that up. The male teenager part. Over a 12 year period, intentional administration was 78% male and 80% ages 13-20. About half went to an emergency department and had minor to moderate outcomes. The most common symptoms were tachycardia, vomiting, agitation, and hallucinations. Good times, good times. So despite being relatively non-toxic, it always depends upon the dose and the person. And if myristicin really is being metabolized to MMDA, then liver function and other foods and drugs on board will play a role. There are countless records of adverse events and calls to poison control centers, but only two deaths that I am aware of. The first occurred (date unknown) in an 8 year old boy who ate two nutmegs and became comatose (10). He died 24 hours later, and the symptoms were reported as similar to that of opium. The second is a 55 year old male that presented with nutmeg in the stomach contents at autopsy (11). There was no other clear cause of death, and postmortem serum myristicin concentration was 4 mg/L. That sounds impressive, but with precious little postmortem data we can’t make much of it. The take home message is that even something as simplistic and innocuous as nutmeg can present dangers. And if you can choke down enough, you may find yourself in trouble. Serious trouble? Probably not, but a trip you probably wished you never took. 1. Gils, Carl Van, and Paul Alan Cox. “Ethnobotany of Nutmeg in the Spice Islands.” Journal of Ethnopharmacology 42.2 (1994): 117-24. 2. Weil, Andrew T. “Nutmeg as a Narcotic.” Economic Botany 19.3 (1965): 194-217. 3. Schultes, Richard Evans., and Albert Hofmann. The Botany and Chemistry of Hallucinogens. Springfield, IL: Thomas, 1980. 4. Shulgin, Alexander T. “Possible Implication of Myristicin as a Psychotropic Substance.”Nature 210.5034 (1966): 380-84. 5. Braun, U., and Da. Kalbhen. “Evidence for the Biogenic Formation of Amphetamine Derivatives from Components of Nutmeg.” Pharmacology 9.5 (1973): 312-16. 6. “Erowid Experience Vaults: Nutmeg – 30 Hours of Bliss.” https://www.erowid.org/experiences/exp.php?ID=8896. 7. “Erowid Experience Vaults: Nutmeg – Nutmeg Mistake.” https://www.erowid.org/experiences/exp.php?ID=3279. 8. “Erowid Experience Vaults: Nutmeg – The Two Week Hangover.” https://www.erowid.org/experiences/exp.php?ID=49394. 9. Carstairs, Shaun D., and F. Lee Cantrell. “The Spice of Life: An Analysis of Nutmeg Exposures in California.” Clinical Toxicology 49.3 (2011): 177-80. 10. Cushny, A.R. ” Nutmeg Poisoning.” Proc R Soc Med. 1908;1 (Ther Pharmacol Sect): 39-44. 11. Stein, U., H. Greyer, and H. Hentschel. “Nutmeg (myristicin) Poisoning — Report on a Fatal Case and a Series of Cases Recorded by a Poison Information Centre.” Forensic Science International 118.1 (2001): 87-90. Tags: hallucinogen, myristicin, nutmeg, poison. Bookmark the permalink. Previous post ← Okadaic Acid: Diarrheal Shellfish Poisoning . . . oh my! When I just eat nutmeg in good recipes, I am guaranteed incredible dreams. Why? If this is Robert G., I enjoy your work, particularly on buprenorphine and loperamide, the latter of which I’m seeing more of in my postmortem work. On to the nutmeg. The proposed metabolic product of myristicin is MMDA, which is a serotonin releasing agent, and can be classified as an empathogen. These drugs have the psychological effects of producing feeling of empathy, love, etc., which is why they are popular at raves and social situations (like MDMA, ecstasy). But nutmeg in a recipe is far, far too little, I think, to be metabolized to MMDA and have these effects. I’d focus more on what situation you are in while you consume these nutmeg laden foods, and attribute that to the good feelings you probably have when you go to sleep and experience your great dreams. For me, I associate nutmeg with the winter holidays, and I can definitely see how the cheeriness of a holiday party or social scene could influence my mood much more than a bit MMDA. nutmeg has never done me wrong, well, except that “one” time during methadone maintenance….otherwise for myself…a fairly fresh nut can be chewed up sort of like a thick brazil nut gone stale. I haven’t eaten more than 2-3 in a 24-40 hour period. goes very well with other psychedelic type compounds……and seems to benefit kratom alkaloids effects . of course this is possibly treading dangerous territory, like kratom, nutmeg is problematic with some drugs, but unlike kratom which is “illegal”as a dietary supplement/food ingredient like nicotine/arecoline/scopolamine etc (though not technically a controlled substance) , nutmeg is perfectly legal to add to recipes and beverages, ayurvedic medicines etc, unlike grapefruit however, there are no warning labels for nutmeg consumption on prescription bottles that I know of. I don’t know how many times nutmeg has helped to help people killed themselves and other people all over the world….but it has to be ALOT, and is probably one of the greyest ghosts in the annals of forensics for being ignored in conjunction with diet related cytochrome p450 issues and medication/illicit substance interactions/overdoses/deaths. I wonder if kratom could chance to hold a hat to nutmeg when it comes to cytochrome p450 induced poly substance overdoses after unfortunate folks hitting coffee shops and being too liberal with the nutmeg shaking scenarios are tallied? probably not. come to think, I haven’t seen one forensics report regarding kratom connected deaths that wasn’t a hit on poly substance causation. Has ANYONE reported a comprehensive mitragynine and related alkaloids induced death that was stand alone mono substance analysis? I really wonder…..having IV”D nearly a kilo of kratom equivalent dose of isolated mitragynine and 7OH mitragynine in the early 2000’s over a 2-3 hour period to dangerously perhaps assess the abuse potential of kratom alkaloids I was quite surprised to garner very mild effect, perhaps maybe comparable to 1/8-1/16th that amount. considering that nutmeg is consumed so widely, and considering that it can have PROFOUND effects on the somatic and psychopharmacological effects that some/many other drugs can have, and considering that it can only take a fraction of a nut seemingly to induce issues in combination with some other drugs, much like sassafras, I won’t be surprised if nutmeg someday becomes an issue for authoritative measures outside of the already privy prison and jail system. apparently initially during its import into european society, this nut was more a drug than a spice, as is often the case. makes me think of coffee’s trajectory compared to that of coca. I have consumed half a nut of nutmeg quite a few times with very pleasurable results. I have found a ton of negative reviews on the effects of nutmeg, but it sounds like those individuals experimented with the wrong dose and didn’t know how to take it. I only consume 1/2 nut and I grind it with a cheese grater, then pulverize it in a small handheld blender. I mix it with traditional co-nutmeg flavors, molasses, cinnamon and ginger and create a gummy consistency. That covers the taste of the nutmeg and makes it easy to consume washing it down with water or whatever. The side effects of dry mouth and the “munchies” are similar to a marijuana high but the amazing state it gives you is far more noticeable. After consuming, three hours passes before the effects kick in. Imagination and contemplative thought are increased, creativity and ideas are mused, and it feels like a great antidepressant and takes away anxiety. As an artist and thinker I am in love with it, but as a nutrition and science lover I am very curious to how it breaks down in the body and what may be the health benefits as well as the risks. The history on it interests me. I have read its possible effect as an abortificant so trying to find research on it as an angiogenesis inhibitor or as a possible anti-cancer properties helping with apoptosis. Maybe it helps to cause cancer or impair brain or liver function? I would like to learn more. I’ve read about nutmeg having anticholinergic effects, similar to atropine or other tropane alkaloids. While myristicin and elemicin appear to work through different pathways than atropine, the end effects are remarkably similar, including the lingering dysphoric hallucinations. Perhaps a strong extract of nutmeg could treat nerve gas poisoning….? Myristicin is fairly soluble in ethanol, and the mace contains much more than the nutmeg. I’ll be experimenting with a mace tincture soon….